Learn the steps to sign in to your AOL account, how to reset your password, and how to find out if your web browser has saved your sign-in information. 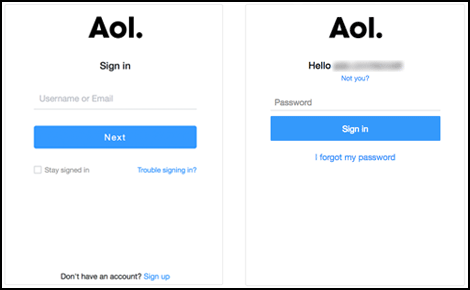 Signing in to AOL now requires your username and password to be entered as separate sign-in steps. You'll no longer enter your username and password on the same screen. 1. Clear your browser's cookies. 2. After clearing your cookies, do a hard refresh of the sign-in page. • Windows/Linux: Press and hold the Ctrl key and press the F5 key. • Mac: Press and hold the Command and Shift keys and press the R key. If these steps don't work, try using another supported web browser. Did you forget your password? If you know your username, you can use the AOL password reset tool to reset your password. After entering your username and clicking Next, you'll see "I forgot my password" on the enter password screen. Click this link and follow the steps to reset your password. Read our "Reset a forgotten password" help article to get step-by-step password reset help. If you can't remember your username or password, check to see if you've saved these with your browser's auto-fill feature. Choose a web browser from the list below to find out how to access information you've saved with auto-fill. Important: The help resources linked below are maintained by the companies that create these web browsers. These third-party companies can't assist you with AOL username or password questions. When you try to sign in from a device, browser, or location that we haven't seen you use before, we may ask you to enter a verification code, sent to your recovery phone or email, to verify that it's really you. Choose where to send your verification code, and then enter the code we send you in the field provided. "Remember me?" to save sign-in information is now "Stay signed in." The option to save your sign-in information has changed from "Remember me?" to "Stay signed in." If you want to save your sign-in information, choose "Stay signed in" on the screen where you enter your username. We've updated your account settings and information page. Read an overview of the new page and the settings you can update here. You may notice some changes to two-step verification when you sign in to your account. You'll now be sent a verification code to enter the first time you sign in from a device, browser, or location we haven't seen you use before. After successful verification and account sign-in, you may not be prompted to enter a verification code again when you sign in using the same device, browser, or location. If you'd like to deuathorize a device, browser, or location, you can do this by signing out of the device from your updated Recent activity page. Get help with deauthorizing a device, browser, or location. Need more help with your username, password, or other account questions? Visit our Account Management help.